Its glory long-since faded, the Amarbayasgalant Monastery nonetheless stands out on the almost deserted Mongolian steppes, its chipped red and gold paint contrasting against a green backdrop of mountains. The dilapidated monastery, which dates back to the 1700s, in many ways serves as a metaphor for Buddhism in this country. Twenty years after the fall of communism, which saw brutal purges that pushed the religion to the brink of extinction, Mongolian Buddhism is struggling to survive in the face of weak finances, a lack of education, suspicious intellectuals, a gnawing religious schism and encroaching Christianity. In two short decades, the hopes raised when democracy returned to Mongolia appear to have been dashed, even as old monasteries are being renovated and new ones built all over the country; young monks are being sent to India, Tibet and Switzerland to study; and a lay movement continues to grow. Buddhism arrived in Mongolia from Tibet in the 13th century, during the time of Genghis Khan. The religion thrived until the beginning of the 20th century, when there were some 100,000 monks – one-third of Mongolia’s male population were Buddhist lamas – living in 700 monasteries. Communism began to take hold in the country in the 1920s and, after more than a decade of attempts to wipe out Buddhism failed to shake the faith, Soviet dictator Joseph Stalin and his Mongolian protege, Khorloogiin Choibalsan, unleashed a brutal purge in 1937, destroying temples and decimating the clergy. No one knows exactly how many monks and nuns were killed but mass graves uncovered in recent years indicate tens of thousands disappeared between the 30s and 60s. Some put the figure at 30,000 killed, with another 10,000 banished to Siberian labour camps. By 1940, institutional Buddhism had ceased to exist in the Mongolian People’s Republic. Erdene Zuu, about 300 kilometres from the nation’s capital, Ulan Bator, is one Mongolia’s largest monasteries and was once its grandest. Built in 1585 in the ancient capital of Karakorum, the sprawling complex is ringed by a massive wall dotted with 108 stupas and once contained 70 temples and shrines. It was home to some 1,500 monks. 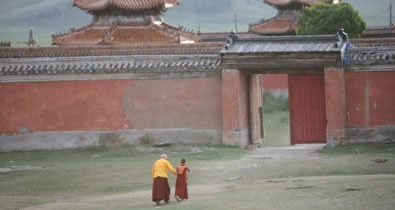 Now, only about 20 buildings remain and there are about 50 monks – mainly young boys – and, on most days, fewer visitors. It feels like a ghost town. Not far from Erdene Zuu is the Shankh Monastery, which is falling apart due to a lack of funds. 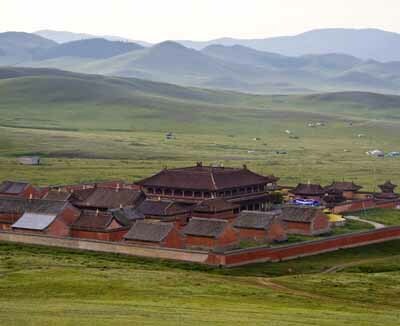 The site, which was founded in 1647 by Zanabazar, the country’s first Jetsun Damba, or living Buddha, was also home to 1,500 monks and was one of the foremost centers for teaching Buddhism. In 1937, the monastery was shut down, its temples burned and most of its monks arrested, executed or sent to labour camps. Just outside Ulan Bator lie the ruins of the once-splendid Manjushri Monastery. The pictures in the Manjushri museum, which sits on the grounds of the old monastery, depict a monastic community that at one time included 10,000 monks. Russian tanks used the site for target practice and left it as a pile of rocks. Ulan Bator’s Gandan Monastery faired somewhat better. Formerly home to 10,000 monks, the monastery was shut down by the communists and the temples were used as garages. However, in 1944, Stalin, under pressure from American president Franklin Roosevelt, ordered the reopening of the monastery. Gunid says a handful of monks who survived the purges of the 30s were allowed to teach Buddhism under the watchful eye of intelligence agents. The lamas spent more time on political than religious lessons. He says that if they met foreigners, they were instructed to lie and say Buddhism was being revived. Gunid, who joined Gandan in 1974, says the Mongolian KGB acted as an admissions board for anyone wanting to enter the monastery, with agents reading each applicant’s biography and then deciding who to admit. A year after the Berlin Wall fell, in 1989, signaling the beginning of the end of the Soviet Union, Mongolia shook off communism and a democratic government came to power. Buddhism began to enjoy a resurwgence and the surviving faithful threw their energy into re-establishing their religion. Gunid, rotund and dressed in a rust-colored robe with greyish-blue cuffs and brass buttons, explains what happened while seated on a platform, legs folded neatly beneath him. There is a picture of the Dalai Lama on the wall. During the seven decades of religious suppression, few monks had been trained in Gandan, the only functioning monastery. The result is that today’s Mongolian monasteries are populated only by very young abbots and a large proportion of shaven-headed boy monks. It’s estimated there are just 2,000 to 3,000 monks in all of Mongolia, with another 300 to 500 studying in India. As the sun goes down at the Amarbayasgalant Monastery, monks, many of whom are of primary-school age, move about the complex doing chores. Some are wearing crimson robes, others tracksuits, their shaven heads the only sign of their vocation. Olonbayar says his monastery now has 60 monks, half of them children. One of the greatest obstacles to the advancement of Buddhism is a lack of funding to fix crumbling buildings and to support monks. Canadian Glenn Mullin, author of numerous books on Tibetan Buddhism and a long-time resident of Ulan Bator, says that while there was just one temple in 1990, today there are 200, but they are mostly small rooms, no larger than 100 square meters, inhabited by just three to five monks. ‘They’re trying to restart the tradition from that,’ says Mullin. ‘I don’t have money for restoration,’ says Olonbayar. ‘The government should restore the temple. It’s their duty.’ But he says, he is aware the government is also short of funds. His monastery has received a US$570,000 grant from the United States embassy in Ulan Bator, but that’s just enough to cover the cost of repairing the roof of the main building and installing fire and security systems. Due to the lack of funds, the monastery is not recruiting at the moment, says Olonbayar. Vesna Wallace, an expert on Mongolian Buddhism at the University of California, Santa Barbara, says that if monks cannot live in monasteries, they must live at home, where they face many temptations. Some have to find jobs to survive and many get married. Gunid says that in the 90s, when expectations were running high, many children came to study at the monasteries, but the numbers have gradually decreased since. ‘Some parents hoped their children would become good lamas but they saw there were no good teachers – the monasteries could not give a good education,’ he says. The lack of an inspiring religious leadership has left intellectuals wary about organised Buddhism. Wallace says the perception that there is corruption, or at least ulterior motives, in Mongolian Buddhism has long existed, stretching as far back as the 17th century. ‘We know historically that there was a long waiting list of people who wanted to join monasteries, because they were exempt from paying taxes to the Manchus, could maintain their own animals and stay out of the military,’ Wallace says. The Mongolian People’s Revolutionary Government, with the encouragement of Stalin, cemented these suspicions with allegations of corruption transmitted via radio, films and even novels, says Wallace. The message was that the monasteries were the last strongholds of feudalism and that the religion was hindering the country’s economic development. As a result of this decades-long campaign, ‘the younger generation today have not devoted their minds to Buddhism,’ says Gunid. Ulan Bator’s Museum of Political Repression portrays monks as ‘social parasites living off the people’. Exhibits include paintings produced during communist times of monks swallowing human hearts and owning houses – an unthinkable notion among devout Buddhists. Some newspapers and television programs continue to raise doubts about the religion. Rossabi says biographies from the beginning of the 20th century often refer to a ‘virulent opposition to Buddhism and corruption in the Buddhist establishment’. ‘That might be in the backs of minds,’ he says. Rossabi describes friends who display ritual objects in their homes, read Buddhist writings and are well informed on the subject. He tells of one group of about 50 Mongolian intellectuals who meet to read sutras. Buddhist religious leaders also speak about the growing attraction of Christianity and Mormonism, both of which are making major inroads in Mongolia. The spiritual attacks do not end there. Adherents of shamanism – which pre-dates Buddhism – have begun to accuse Buddhism of being foreign, saying Mongolia should return to its national religion, which is growing in popularity. Buddhism is further hampered by a lack of a central organizing body. While many experts say the Gandan Monastery is Buddhism’s headquarters in Mongolia, some monasteries do not recognize its authority. And there is no recognized leader, unlike in Tibetan Buddhism. In 1991, Mongolian lamas asked the Dalai Lama for information about the Ninth Bogd, Jambalnamdalchoijijantsan, who was born in Tibet in 1932 and was for years recognized as the reincarnation of the Eighth Bogd. He visited Mongolia in 1999, where he was recognized as the head of Mongolian Buddhism, but the visit met with complaints from China because of his close ties to the Tibetan government-in-exile and the Dalai Lama. Another distraction is Dorje Shugden, a relatively new Tibetan deity and a source of dispute around the world. In 1996, the Dalai Lama declared the deity an ‘evil spirit’. The cult of Dorje Shugden has been promoted in Mongolia by Tibetan adherents in Switzerland, India and Nepal, leading to friction. Of the 200 monasteries in Mongolia, some 25 per cent are said to worship Dorje Shugden, one of which is the grand Amarbayasgalant Monastery. When told that Olonbayar believes Mongolian monasteries are independent and that there is no central authority, Gunid looks irritated. Gunid, who studied in India and worked as an interpreter for the Dalai Lama during a visit to Mongolia, further defends his mentor. Mongolian Buddhism may be down, but it is not yet out. She says today she sees a different kind of movement, one in which lay practitioners are establishing Buddhist centres and offering Buddhist teachings for lay people, meditation retreats and lectures for university students. Mullin says some people may feel discouraged because the monasteries ‘don’t have their act together’. Editor’s Note: It seems that Dorje Shugden’s influence is getting stronger in Mongolia due to the efforts of Dorje Shugden Lamas and practitioners there. We rejoice to see so much work being done to spread Dorje Shugden in Mongolia. As Dorje Shugden spreads all over the world, more causes will be created for the ban to be lifted faster. This entry was posted on Friday, April 6th, 2012 at 12:54 pm	and is filed under Articles. You can follow any responses to this entry through the RSS 2.0 feed. You can leave a response, or trackback from your own site. This is a true test for the Mongolians as they do not have any high lamas of Geshes there to guide them. They do not even know if the things and method if they are practicing is correct. These are all passed down to them. It is true that it is a test for them as they do not stay in the monastery full time, doing things that monks should be doing all the time. They have to be involved in secular work and politics as well. With all these extra things for them to do, if their minds are not strong, they will be easily influenced to not do their practices. Hence, not being able to keep their vows. Especially with all the temptations around them, while they are not in a good environment to practice. In my opinion, it would be great if there are some high lamas that would go into Mongolia to teach the monks there so that the past glory of the religion can be restored. With the US giving money to a Dorje Shugden monastery it shows that Dorje Shugden has made some impact on the US government in a positive way. If this is not the case, I believe that the Dorje Shugden monastery would not receive any fund to rebuild their monastery.